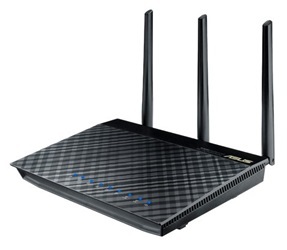 The ASUS RT-AC66U Dual-Band Wireless-AC1750 Gigabit router brings you into the next generation of wireless connectivity with leading 802.11ac Wi-Fi connectivity support—that's up to 3 times faster than current wireless N speeds. One of the first of its kind, the RT-AC66U gives you a combined 1.75 Gbps of wireless data from the 2.4 GHz and 5 GHz streams for unprecedented wireless performance when gaming online, streaming HD media, and performing other bandwidth-intensive tasks. The RT-AC66U offers smooth lag-resistant multitasking and super-fast streaming, while ASUS AiRadar intelligently strengthens wireless connections via powerful amplification, offering future-proof optimized performance. I ended up returning a different router which didn't end up covering enough of my 2 bedroom apartment. This router is great for streaming to my Roku and has handled 10 different devices on the network at any given time. For those interested, the router I returned was the Medialink - Wireless N Broadband Router - 300 Mbps, which, despite having great reviews, just didn't cut it for me. The addition of the external antenna really adds to the range. I bought this to replace a Cisco Linksys that I've had for 5 years. So far it works great. Range is about comparable to the Linksys...perhaps just a little stronger. Guest access features are nice. It was just a little annoying that the router "reboots" when making some minor changes. No big deal, you just have to wait to reconnect. I've been using Linksys WRT54G with Tomato and it had been solid (I previously had a WRT54GL, but that got fried), but wanted to upgrade, specifically to use the 5 GHz band, since I have other legacy devices using 2.4 GHz. So I got the Asus RT-AC66U to future-proof myself. My mistake. The 5 Ghz on this is flakey at best. I need to reboot the router everyday, as the 5 GHz will stop working (stop accepting connections, although the status page says it's fine). After some more research, turns out it's a known issue and they're "working on it." So, essentially, it's just a 2.4 GHz band router. If that was the case, I could have gotten a good one for less than half the price. Not sure why no one else on the Amazon reviews pointed this out. If you can afford this router, buy it. Simply the best. I upgraded from a D-Link DIR-655, and the improvement in speed and coverage was dramatic. Now I have no dead spots in anywhere in my 3-story, 6,000 sq. ft. home, and fantastic response times all around. My multi-year quest for the perfect router has finally ended! Received my ASUS RT-AC66U last week. Bought this router based on reviews and considered the fact than AC band is where wireless is headed. This router can handle that band and is backward compatible. Set-up took about 5 minutes. Based on review advice, I then turned up power output to the max 200W. My carrier is fiber optic and I subscribe to the 100Mbps upload and download speeds. With my new router wirelessly I get speeds of 116Mbps download and 102Mbps up! This is on the 5Mghz N band. The speed is the same as using the ethernet connection and 3X faster than my old Dlink 660. So far I am extremely satisfied. Would definitely recommend. Can't wait to see what this router would do on the new AC band. Return to top of "ASUS RT-AC66U Dual-Band Wireless-AC1750 Gigabit Router"! !